There are three critical issues of water security – access, pollution, and efficiency – that can be addressed through better infrastructure. The challenge of implementing engineering solutions is identifying the appropriate technology and overcoming region-specific political, social, and economic hurdles. For each issue, Mission 2017 identifies the necessary technology and the steps to link new technology with common practice. An important aspect of water security is ensuring that every person has access to clean water. However, the natural supply of water is not constant, although demand is. For this reason, it is important to stabilize water supplies using water infrastructure (e.g dams and pipelines). Despite current efforts though, one third of the world still lacks access to improved water . Water access can further be limited due to either economic or physical water scarcity. Economical scarcity means that clean water resources exist, but they are unaffordable – either in terms of time spent obtaining it, or in terms of cost. This generally results from a lack of stable water distribution systems. Physical scarcity means that the region has little to no clean water resources. This results from either overuse or from lack of sufficient precipitation and groundwater reserves in a region. Examples include central Australia and North Africa. The following two maps show the natural occurrence of water resources versus the economic availability of these water resources. Comparisons of the two maps reveal the drastic disparity in water availability and use due to poorly developed infrastructure. Figure 2: Managed water access. Water stress is defined as withdrawal divided by availability. Poor infrastructure decreases the natural availability of water . The first step to improving global water security is improving water access in regions that are the most water scarce and densely populated. Based on the maps above, water scarcity is the most severe in Africa, certain regions of Asia, and Australia. Climate change will only accentuate this problem. Solutions for water scarcity are grouped by the two causes: economic and physical scarcity. In economically water scarce regions (e.g. Central Africa) the problem lies not in a lack of resources and precipitation but in water distribution systems. In these regions, implementing the use of rainwater harvesting will provide a way to capture unused precipitation in both rural and urban cases. The advantage of this system is that it is inexpensive and can be operated at any scale (personal or municipal). The specifics of rainwater harvesting and its implementation vary by region and will be detailed elsewhere in this site. For long term improvements in urban regions, additional changes are needed for centralized distribution systems such as material replacements, better hydraulic pressure, and better maintenance through regulation. Regions with a physical scarcity of water like Central Saudi Arabia, North Africa, and Australia cannot rely solely on rainwater capture networks since precipitation is too low. Instead, new sources of water must be created and current water resources must be maximized. The construction of water recycling plants should be the first step in self sustainability because of its low cost and potential to double water supplies. Any water that cannot be recycled can be used to replenish depleted aquifers where it can naturally purify over time. As a long-term solution to meet the growing water demand, desalination infrastructure can be used with seawater or saline aquifers that have non-potable water. Ensuring water access includes creating access for the future. Within regions like the United States, China, and North Saudi Arabia where groundwater is being used at an unsustainable rate, there should be a switch to alternative sources of freshwater. To do this, municipal rainwater harvesting systems can capture water that is otherwise wasted. As rainwater harvest networks are established current dams should close and fewer dams should be built to reduce the impact on ecosystems and the water supply (see article for more detail). In addition, efforts to address climate change must be made. Developed countries should require companies to capture carbon dioxide at the source and fund projects to capture carbon dioxide directly from the atmosphere. One in every ten people does not have access to clean water . Every year, more people die from unsafe water than do from all forms of violence combined . This pollution is mainly due to human waste. Every day, 2 million tons of sewage and industrial and agricultural waste are dumped untreated into the world’s waterways. In developing countries, 70% of industrial wastes go straight into rivers and lakes . The human right to water includes access to clean water. As the world’s population grows, a long-term solution to pollution is needed to ensure this right. Solutions must address the heart of the problem: inefficient government regulation and lack of awareness of the dangers of pollution. The three main sectors that contribute the most to freshwater pollution are sewage, industry, and agriculture. Solutions are prioritized based on the most polluted regions. The dirtiest water sources are located in South Asia and Africa. Within these regions, inefficient or non-existent sewage systems are the major source of pollution. To improve these systems, effluent sewage systems should be established in urban areas and latrines in rural areas. Effluent sewage systems have roughly the same efficiency of traditional sewage systems, but operate at 25 percent of the cost . For rural areas that cannot afford treatment plants, latrines in conjunction with water education programs serve as a viable alternative. In poorly regulated urban regions like Guangdong in China, the major pollutants of water originate from industry and not from domestic use. To decrease pollution, environmental regulatory agencies should be founded to enforce regulations. Cap and trade will be used by these agencies as the preferred method of regulation. Money generated from cap and trade can be used to fund water purification projects to reclaim already contaminated water sources. In addition, companies will be incentivized to invest in less pollutive technology such as water recycling and filtration. In developing regions where agriculture contributes a significant proportion of GDP, agriculture can contribute to a significant amount of water pollution. The EPA estimates that agricultural runoff in the U.S can account for at least half of the impairment of rivers in certain regions . Runoff is often due to a lack of education and communication. Community-based educational programs can be used to change farming practices. These programs would facilitate a shift away from more intensely water polluting practices such as monocropping and chemical supplementation, and instead promote cleaner practices such as crop rotations and the proper use of chemical fertilizers. Current global water usage is unsustainable and must be reduced in order to secure access to water for the next 100 years. Water use in developed countries such as the U.S and China far outpaces the rate at which it is being replenished. The two sectors with the heaviest water use are agriculture and energy, displayed in the charts below. 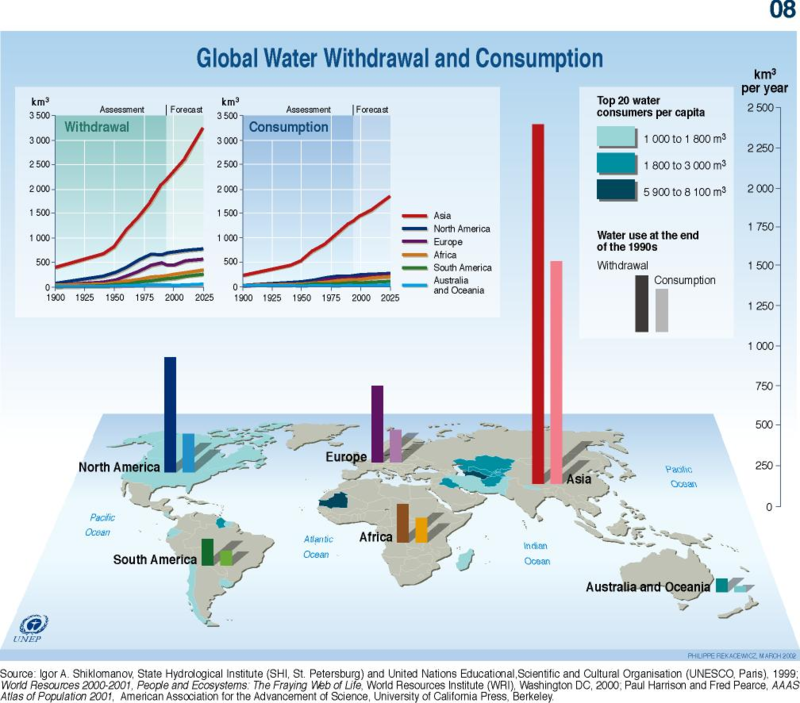 These charts detail water withdrawal (water that is taken out from the water system) and consumption (water that humans can no longer be use) by continent and sector. Figure 2: This map highlights the large amounts of water withdrawal by continent. Taking account for differences in population and in the ratio of water consumption to water withdrawal, we can evaluate the efficiencies in water use between nations based on these two characteristics . Figure 3: This map highlights water use by sector across the world . 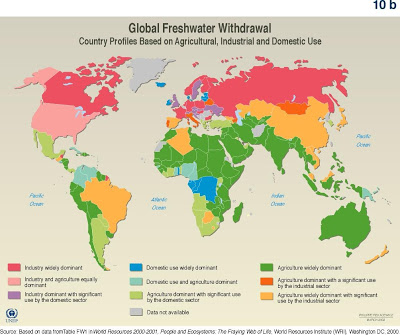 Agriculture accounts for 70 percent of global freshwater consumption and represents the dominant use of freshwater within regions like Africa, Australia, and South America. This means that any waste also comes in large quantities. Most water is wasted in surface water runoff and evaporation. These problems can be addressed by improving flood irrigation by lining canals with concrete or clay and using surge flooding to reduce runoff. Simple changes to irrigation techniques, such as lining canals, surge flooding, and reuse, are low cost and easy to implement solutions. These techniques can reduce global water consumption in the agricultural sector by 20 percent, a significant improvement. Outside of the agricultural sector, energy production accounts for the next largest use of water. Globally, water use in the energy sector is expanding (e.g. in the U.S., energy sector water consumption is 27 percent) . To reduce wasted water in the energy sector water hungry fuels, such as some biofuels and coal, should be replaced with more efficient fuel sources. 1. U.S. Census Bureau. International Programs Center: Population Clocks.